“Escape between land and sea!” Sanary-sur-Mer is a beautiful seaside resort located in the heart of Provence, with a charming and authentic fishing port. The town welcomes you in all seasons so you can discover Provence’s traditions and its relaxed lifestyle. Known as one of the most beautiful tourist site of the French Riviera, you can enjoy a moment of relaxation on the sandy beaches or a moment of pure idleness in a café for a refreshing and an exhilarating moment along Mediterranean Sea. Ideally located in Sanary-sur-Mer, a small picturesque village of the French Riviera, the 3-star Hotel Holidays & Work welcomes you in a relaxing Mediterranean setting. This hotel is an establishment of choice to enjoy a pleasant stay by the sea with your partner, friends or family. This hotel has 24 spacious, air-conditioned, harmoniously decorated rooms with modern comforts ; they feature private bathrooms with walk-in shower or bath. Rooms’ facilities offer an ideal alternative for professional stays, allowing to combine the pleasures of a comfortable stay in the heart of Provence and the requirements of your business. A helpful staff welcomes you in a good mood, reserving a personalized welcome. A wide choice of accommodation is available in fully equipped double rooms or family rooms triple or quadruple, with all the options worthy of a modern luxury hotel. For your comfort, these air-conditioned rooms include the following amenities: wi fi connection, flat screen TV, hair dryer, toiletries, minibar, safe, kettle, cot on request, private terrace with breezy view for some rooms… Some rooms have been specifically adapted to be accessible to people with reduced mobility. A delicious full breakfast is offered each morning to our residents, to start the day with joy and good mood. At one hundred and fifty meters from the port of Sanary, our restaurant Holidays & Work offers contemporary cuisine with a thousand Mediterranean flavours. While offering a full meal at lunchtime with particularly attractive formulas, the establishment presents a menu of refined dishes of fish and home-cooked meats, accompanied by wines from its winery “Le Grand Chêne” with Provencal grapes from organic farming. Other amenities include privatization of the dining room for cocktail buffets for all types of private or corporate events. Sanary-sur-Mer’s Hotel Holidays & Work, offers an exceptional seaside setting on the edge of Var coast with turquoise waters. Featuring an equipped and connected seminar room which can accommodate up to 35 people, as well as a meeting room, the facility receives and accompanies many companies in the organization of their events. Located at 10 km from Toulon, 50 km from Marseille and close to exceptional sites such as the Parc National des Calanques, the Hotel H&W is the ideal compromise to organize your business events, seminars or team building, enjoying relaxing moments in a warm and contemporary setting. “Very well located hotel – completely renovated – very good and clean room – friendly welcome – close to all shops and restaurants, and the port also – very convenient on-site parking – buffet breakfast – pleasant environment”. “Neat decoration, spacious comfortable and soundproofed rooms, great bedding, bathroom well equipped, parking on site, absolute calm, only a few tens of meters from the port. Everything is thought for the wellbeing of the customers. Hearty breakfasts with fresh products and wide choice. In short, an establishment that is difficult to leave so much we feel good! A 4-star comfort at the price of a 3-star hotel. Congratulations and thank you!!! 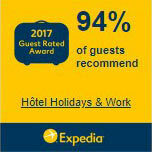 “Superb hotel of exemplary cleanliness and great comfort, located near a typical Provencal marina. Thank you to the management and staff for their kindness and availability at all times”. 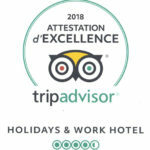 A warm greeting awaits the visitors in this hotel which combines relaxation and work in the heart of this picturesque village on the Var coast. Its privileged location, close to the typical port of Sanary-sur-Mer, and the beaches of Portisol and Six Fours, makes this hotel, a delightful resort suitable for relaxation and seaside leisure, nautical or pedestrian in all genres.